This is something that I've touched on in earlier posts but due to today's events at work I thought about this a bit more, and felt like sharing it. I work as a Marketing Executive for a company that manufactures and sells, liquid applied, peelable protective coatings. These coatings can be used in so many different ways from protecting windows and doors on a construction site to acting as a nuclear contaminant tie-down. I am just about to launch a new product for the chemical milling industry and as a part of this launch I managed to secure some funding from my local council and their enterprise partnership company. As a result of this I've been promoting our company and the funding and have had to do several live radio interviews. 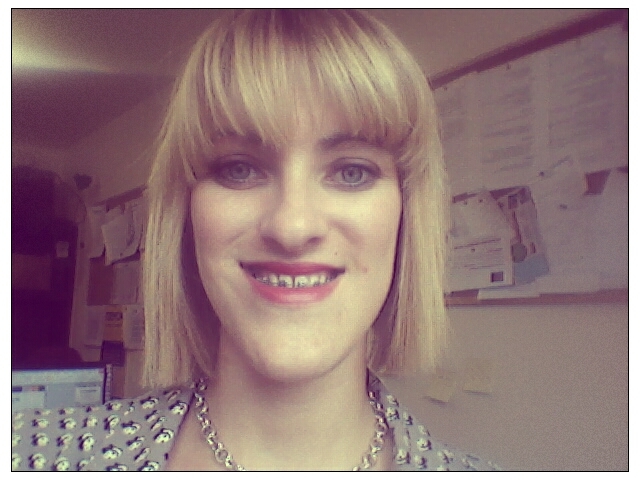 As an adult with braces I can't let them get in the way of my work, I just have to be professional and get on with it. However as most people with braces will now that your teeth are always moving, and my speech can change on a daily basis, so it's not always so easy to speak without tripping up over certain words or sounding lispy. But I did it and the interviews have gone well, I have listened back and I didn't sound too lispy or stupid so I was fairly pleased and felt quite good. "Yes, of course, come over I would be delighted!" "Oh ****, what the hell am I going to do, everyone watching it will be looking at me and laughing. Laughing at the girl with the big chin and braces on TV." I went through to my boss and we started planning the interview, what I would say, what i wouldn't say etc and while we were sat there I decided that I had to do the interview, it's my job, but also that I had to do the interview for me. I had to put myself out there on TV in all my big chin, lipstick wearing woman, adult in braces glory and accept that for the time being this is the new me. I'd learnt to accept myself and my large chin and my underbite a while ago, but I guess, if I'm honest, I hadn't quite yet accepted the new me with the large chin, underbite and braces. So I re-applied my lipstick and off I went to do my interview. It went well, it wasn't live thankfully, so hopefully they can edit it together nicely. I really hope I don't come across a complete idiot! I shall mark this day in my Orthognathic Surgery diary as the day I accepted the new me with braces. Accepting I'm an adult with braces. I found that what works best for me is to come up with a reason to tell them I have braces, because it breaks the ice. For example, "sorry if I'm lisping, I just had my braces adjusted and I'm still getting used to it"-- even if the lisp isn't that noticeable, it kind of gives the person permission to acknowledge I have braces and then they can move forward. Then they aren't awkwardly gawking at them whilst trying not to be obvious the entire time. Most of the time the reaction is, "oh yeah I had them too", "my kid has them", "I thought you looked different", etc. I keep telling myself that I'm WAY more aware of them than other people, too, and that seems to help. Hahaha, so true! I totally feel more awkward when people are trying to have a look but don't say anything because they are trying to be polite. It's so much easier when people ask or just verbally acknowledge my braces. I thought it would be the other way round, I thought I'd die of embarrassment or feel really self concious if someone mentioned them. But your right, when you speak about them you can just move past them. I think I will try just bring them up if it starts to get a bit awkward. I shouldn't really put that on the non brace wearer, they are just being polite and trying not to make a big deal out them. It's funny how many people tell me that they don't even notice that I have braces or that I sound different and I'm in people's faces every day as a speech therapist. I have definitely struggled with acceptance and I've had my braces on for over a year and a half. Much of my struggle has been that they needed to make my underbite worse in preparation for surgery, so I feel like my face has changed a lot in a negative way. Hopefully, I'll be able to laugh about it soon! Thanks for your comment. I totally agree, it is so hard to accept having braces and how you look when it's a) constantly changing and b) it gets worse before it gets better! Yes, hopefully we will all be able to look back on this process in year to come and have a good old laugh about how horrible it was at the time, but how worth all the upset, pain and discomfort was in the end. Having braces sometimes create small problems. Many people don't use braces because of like it wouldn't look good or they have to take additional care for it. They don't see that after some time, it will make their teeth look more good.